…you look around and see you are not alone in the neighborhood: The prepubescent boy or girl scrubbing father’s back. The saggy old men lolling about, forcing you to face the inexorable effects of gravity on male body parts. The yakuza with his vibrant and fascinating tattoos, brooking stares from no one. The screaming kids and chattering women audible from the female side of the bathhouse (in stark contrast to the male side, where stolid silence is generally the status quo). And the soaped up shaving salaryman with fogged-up eyeglasses who seems to enjoy few things in life – except a smoke, a good meal with friends and family, maybe the occasional tryst with a co-worker, a professional or a casual. And this bath. Never will I ceased to be amazed by the bathing culture in Japan. 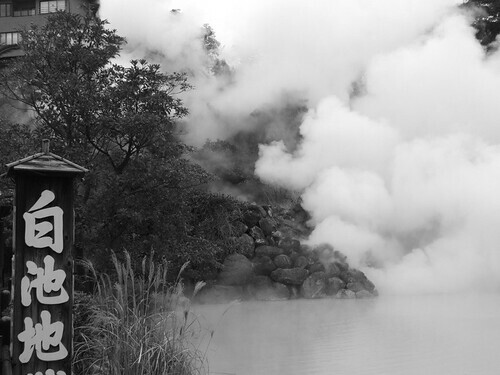 My first real experience with Japanese onsen (温泉) was in Beppu (別府) in Oita Prefecture, Kyushu. A city sitting on quite a large volcanic vein, Beppu is well known for its unique and various hot springs, ranging from full mud baths, warm sand, scented waters, multi-colored waters, and traditional outdoor pools (called rotenburo, 露天風呂). Although onsen create the occasional stir (e.g. concern over contagious people in a public area, and the Otaru Onsen lawsuit by foreign residents of Japan in 2001), they are still widely celebrated as some of the best places to relax in Japan. Calming yourself after a long work day by enjoying a dip in the local bathhouse. Taking the weekend to stay in a luxurious onsen hotel and never leave the premises. If the Japanese are a hard-working people, then they know exactly where to go after such stressful conditions, and how best to relax. When I first heard about the bathing culture in Japan, I didn’t think I would partake. Why? Because I was thinking like a stupid closed-minded foreigner. Sure, showering and cleaning yourself is a private activity, but who defines privacy? The Romans enjoyed public baths two thousand years ago, when they were considered the epitome of civilization. Japanese deserve the same consideration. Leave your modesty at the curtain. Once you are in the group area or locker room, remove all your clothes. Lockers will be provided or there may just be a small wicker basket in which to place your personal items. Entering the bath. Grab a small hand towel for use in the onsen. I know we’re more than commonly taller and bigger as foreigners, but don’t take a full-sized bath towel inside. You’ll get to use that when you emerge. When you do enter the bath, you should see a showering area. Pull up a stool and clean yourself thoroughly with soap and shampoo. Rinse yourself off completely, and do not splash other people with water. You are now ready to enter the first bath, the hottest bath. I doubt any of us need instructions at this point. All I can tell you is: don’t swim, don’t splash, and try not to get your hand towel in the water too often – set it on your head when you’re not walking around. The order of baths goes – hot, warm, cold. Skip the cold if you like, and repeat as needed to ensure maximum relaxation. Many bigger onsen have options like electric baths, steam rooms, baths with cypress tree oils, and other specialties. So how do you feel? Like you’ve submerged yourself in pure, wet, tasty sunlight. As if your spirit could be lifted a few inches from your body and felt by every essence of your being. You are no foreigner. 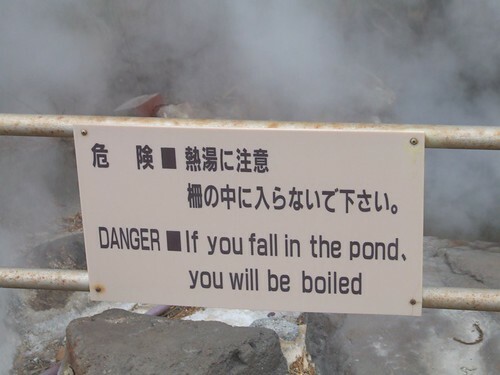 The person soaking on the other side is no Japanese. You are two people who happen to be in Japan enjoying a soak. As it should be for all entering the world of the onsen. I think I was in some small neighborhood onsen of Kagoshima the first time it happened. Although sento (regular bathhouses) are commonplace enough in the rest of Japan, this southern capital had taken it upon itself to fill every last public ofuro with volcanic bliss, powered by the overlooking peninsula-once-island Sakurajima. And it worked quite well; aging Japanese businessmen rest their weary bones in waters more soothing than any available in the urban sprawl that is Tokyo. I too enjoyed lowering my body into the watery abyss, letting my face remain just above the surface to inhale the slightly sulfuric fumes of what had become my thrice-weekly indulgence. I didn’t really have a good answer for those men; with the exception of Palm Springs and what I assumed were a smattering of geothermal springs in the Rockies and Sierra Nevada mountains, I had no idea of what calming soaks I could have missed in my own hometown. Are hot springs even possible in the central US, where evidence of volcanoes are thousands of years in the past, and unlikely to produce anything remotely similar to what one sees all over Japan? In Japan, most of the springs are fueled by underground water sources coming into close proximity to magma or volcanic “veins” of heat rising to the surface. As these types of hot springs are usually superheated, many have to be regulated so as not to scald the bather. Although some springs in the United States are heated in a similar manner, others are the result of geothermal heat: the deeper you go towards the center of the Earth, the higher the temperature of the rocks. Hot springs powered in this manner need to reach a sufficient depth in the planet’s crust to achieve any significant temperatures (enough for soothing baths, anyway). As volcanic springs are able to form closer to the surface and with much higher temperatures, I prefer their waters coursing through my skin. My Google search led me straightaway to west Texas, more specifically Big Bend National Park, where an outdoor hot spring pool lay on the border between the great state and Mexico: the Rio Grande. Mere walking (or swimming) distance from the closest Mexican village, the springs is remote by even Big Bend standards – just keep driving east until you see a sign; turn onto an unpaved road; be careful as the unpaved road forks and leads you onto a narrow and treacherous road; dismount and follow the signs, taking note of the trinkets (hiking sticks, wire scorpions) Mexican craftsmen have left with a small note requesting money; do your part and help border relations… the path across the river may have been muddied by 9/11, but we still both live with each other, side by side, each helping the other in times of need. A little farther down the sandy path and you’ll come across the ruins of what was once the bathhouse, now a mere foundation used to prevent the water from flowing directly into the river. I must admit I was skeptical… but fear not, these springs are comparable to any seaside onsen in Japan; not quite up to the sulfuric taste of Ioujima, but definitely a close second to Furusato Onsen on Sakurajima. The hot springs at Rio Grande Village is recommended for its remote location, soothing waters, and communion with nature. Take a soak in the shadow of Native American pictographs and melt your troubles away in the Texas sun. Everything is bigger, better, and apparently more relaxing in Texas. 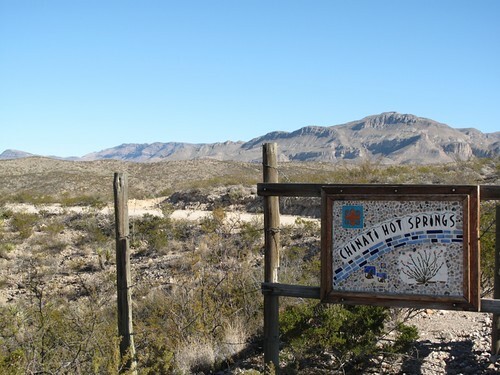 If you desire a little more privacy, drive about a hundred miles west to the town of Ruidosa, where the private resort Chinati Hot Springs lies. You may have to deal with runaway burros and adapt to the owner’s bloodhounds, but once you settle, you’ll find an excellent place to get away and soak under the starry night: no cell phones, no ambient noise, not even a car wheel turning. The water at Chinati comes out at a mere 109 degrees, so it’s best to catch it quickly. You do have the benefit of a private bath. Remember, hot springs are best when the weather is chilly. Unlike in Japan and Taiwan, where the springs are primarily used for cleansing following bathing, the waiariki (hot springs in the Maori language) in New Zealand are similar to water parks: places for families to gather on the weekends in bathing suits and go down stomach-wrenching slides to finally cough off a liter of water at the bottom… ahhh… how I do miss it… if only I could afford the airfare to go every week.